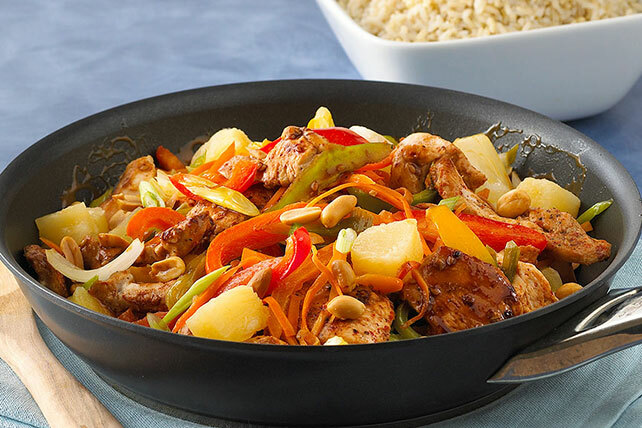 Toss together chicken, veggies, pineapple and peanuts to make an Asian-style stir-fry that delivers big flavor—for very little effort! Toss chicken with 1/4 cup dressing and hot sauce; set aside. Heat remaining dressing in large nonstick skillet on medium-high heat. Add vegetables; stir-fry 1 min. Add chicken mixture; stir-fry 4 to 5 min. or until chicken is done. Stir in pineapple and nuts; cook 5 min. or until heated through, stirring occasionally. Garnish with 1/4 cup chopped fresh cilantro or thinly sliced green onions just before serving.